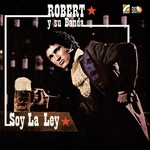 "Released in 1978, Soy La Ley by Robert Y Su Banda is an obscure but sought-after slab of Colombian salsa dura with the special distinction of having the 'original' version of Álvaro José 'Joe' Arroyo's monster hit 'Rebelión' hidden in plain sight on the second side of the record. The band's leader, Roberto Antonio Urquijo Fonseca, is still active today and, hailing from Barranquilla, Colombia, is as steeped in the costeño sound of cumbia as he is in salsa. Roberto certainly has a perfect voice for salsa, bringing to mind that of the Boricua super star sonero Héctor Lavoe . . . On this album the previously mentioned 'Rebelión' of Joe Arroyo kicks off side two but bears the completely different title 'El Mulato' and is credited to Adela Martelo de Arroyo, Joe Arroyo's wife at the time (Arroyo was signed exclusively to Discos Fuentes). The arrangement, by Enrique Aguilar, is also quite different from 'Rebelión' with an introduction that sounds inspired by Tite Curet Alonso's composition 'Plantación Adentro' (from Willie Colon Presents Rubén Blades Metiendo Mano!, 1977) but it contains all the elements of Joe's later global smash with the exception of being rhythmically more of a cumbia than a salsa . . . With Michi Sarmiento's brilliant arrangement plus La Verdad's modern reinterpretation of the nearly decade old tune, 'Rebelión' became a mega-hit even in Asia and Africa and Arroyo's fame shot around the world and made him the international legend he remains to this day, eight years after his untimely demise. Besides the aforementioned 'El Mulato', the title track 'Soy La Ley' is a dance floor burner and comes from the pen of Joe Arroyo as well, as does 'Mi Cariño No Espera', which is another cumbia/salsa hybrid . . . Aside from the Arroyo originals, there is the super-hot guaguancó 'Son Candela' by the venerable Cuban singer/composer Joseíto Fernández, the guajira son 'En La Inmensa Soledad', made famous by Los Compadres, the upbeat sounding lament 'Preso Sin Sentencia', originally by Puerto Rican plenero and percussionist Rafael Ortiz Escuté (aka Joe Pappy), plus an absolutely burning version of Mexican crooner Armando Manzanero's 1967 hit 'Aquel Señor'. The record is rounded out by the salsa tune 'Si Ella Pregunta Por Mí', which was covered in 1980 by Orquesta Borinquen." --Pablo Yglesias aka DJ Bongohead Presented in facsimile artwork and pressed on 180 gram vinyl.